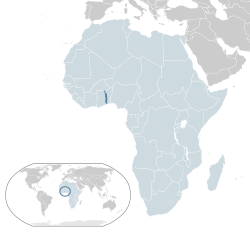 Togo is a small country in West Africa. It is bordered by Ghana to the west, Benin to the east and Burkina Faso to the north. The capital city Lomé is located along the Gulf of Guinea. In 2016, about 7.5 million people lived there. The official language is French. From the 11th century to the 16th century, various tribes entered the region from all directions: the Ewé from the east, and the Mina and Guin from the west; most of them settled in coastal areas. The Portuguese explored the area in the late 15th century. As Togoland, it became a protectorate of Germany in 1884. After World War I, Togo was ceded to the French. Togo gained independence from French rule in the 1960s. General Gnassingbé Eyadéma became the military leader in 1967. When Eyadéma died in 2005, his son, Faure Gnassingbe became president. The economy of this small African country is based on agriculture. Agriculture provides jobs for 65% of the labor force according to the CIA Factbook. Agricultural products include coffee, cocoa, cotton, yams, cassava (tapioca), corn, beans, rice, millet, and sorghum. Industries include phosphate mining, agricultural processing, cement, handicrafts, textiles, and beverages. Togo's economy is primarily agricultural. The president of Togo is elected for 5 years. The president is also the commander of the armed forces. The president also has the right to begin legislation and dissolve parliament. After Togo's independence from France, General Gnassingbé Eyadéma became the military leader. When Eyadéma died in 2005, his son Faure Gnassingbe became president. Togo is divided into 5 regions. The regions are divided into 30 prefectures and 1 commune. From north to south the regions are Savanes, Kara, Centrale, Plateaux and Maritime. About 51% of the population has local beliefs, 29% is Christian, and 20% Muslim. The Togolese enjoy many foods including tropical fruits, pastries, and many different products made from peanuts. Major drinks include tea, coffee, and wine. Togolese often snack on plantains and French donuts or beignets. ↑ "Constitution of Togo". 2002. Retrieved 2011-11-20. ↑ "June 2008". Rulers.org. Retrieved 2015-10-25. ↑ 3.0 3.1 "Togo". UNdata. Retrieved 20 September 2017. ↑ 4.0 4.1 4.2 4.3 "Togo". International Monetary Fund. Retrieved 20 September 2017. ↑ Togo. CIA – The World Factbook. Cia.gov. Retrieved on 2012-01-08. This page was last changed on 30 August 2018, at 16:14.